This helicopter was developed nearly 60 years ago and deployed in many countries. 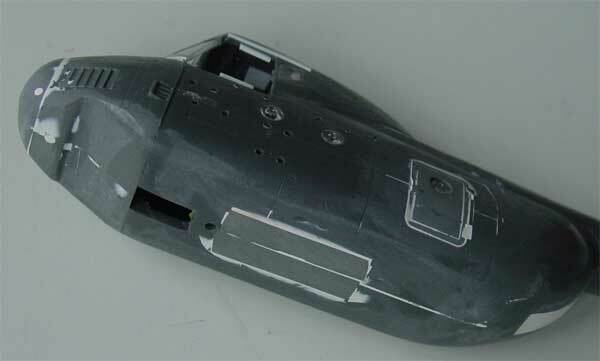 This project will use the AER mouldOVA 1/72 kit. Later on, it turned out that the KP 1/72 kit is better. However, this kit # 72031 was used for this project. What can be done with this kit? 1. To really improve the model you first need to cut out the various grills. I did not do this, but suggested the many open grills through dark paint. 2. 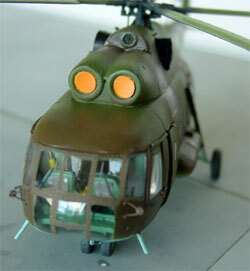 The Mi-4 has aft sliding doors at the cockpit sides; these need to be more pronounced as in the kit. Some plastic strips were added on top of these slide doors and faired in. The doors will be positioned onto the sides, not "into" the opening. 3. I also replaced the large floats on this model, setting it on fixed wheel gears. This was made from scratch with some rods and spare wheels from the spares box. 4. The crude cockpit "pilots+seats" were replaced with some pilot seats made from card. 5. the bulkhead #53 got some openings towards the rear lower cabin as in the real chopper. 6. the various smaller steps and antennas were replaced with fine rod and metal pins. 7. the cabin interior was only painted and the side cabin door closed and filled. After basic assembly, the model got a grey base coat to discover any flaws. These were corrected and a camouflage scheme was applied. Addtional details added were the curved jet exhaust pipes below the nose, very air intakes on the sides (marde from bomb halves) and some antenna's. Used were Humbrol HU105 green and Hu32 dark grey, applied with the airbrush. Windows were masked off. As I had the KP kit with a nice Czech scheme, some decals were used from this kit. 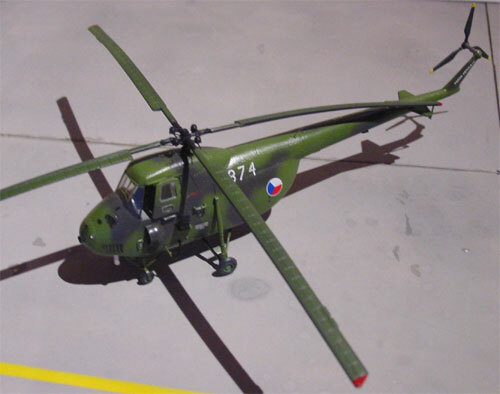 The scheme representing a typical Mi-4 number "1874" as used by the Czech Air Force. The KP decals are fine. Finally bend the rotor blades for a more realistic setting. The "Hound" is ready now and is a nice addition to the Czech collection. 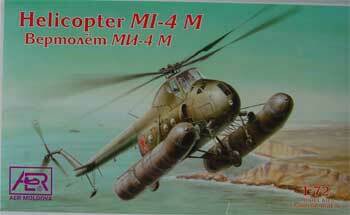 Mil Mi-8 / 17 "Hip"
This helicopter was extensively used by many (former) Eastern Block countries. 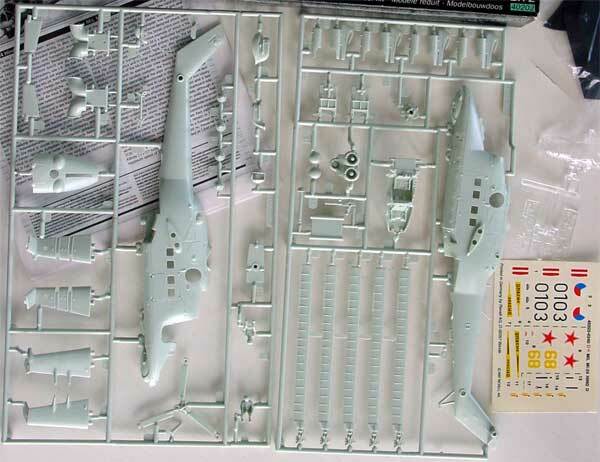 KP has issued a basic but nice 1/72 kit in 1989, packaged as kit #28. 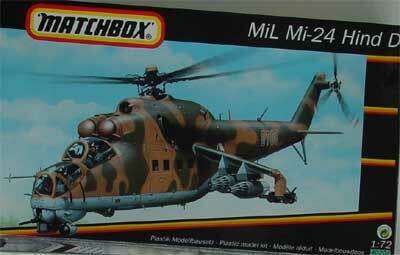 Also a more powerfull sub-variant Mil Mi-17 can be made from this kit as you get some extra parts for the gear and Mil 17 engine housing (and the tail rotor is at the port side). 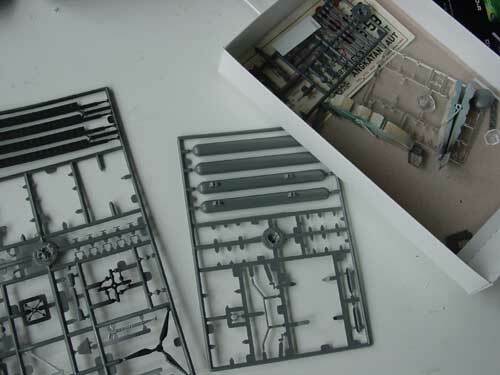 The kit parts are very light grey with raised panels and there are many small parts like scoops and fairings that are separate. The decals are basic and brittle and for several schemes shown at the karton box. There is quite an interior though of the cabin insides not a lot is seen. The kit was made straight out of the box. The rotor fairing gap was made a bit large in order to fit the main rotor later on. Only some details were added in the cockpit area with its clear glazing windows. These windows need masking later on when the colours are applied. The rotor head got some hydraulic lines made from stretch sprue. 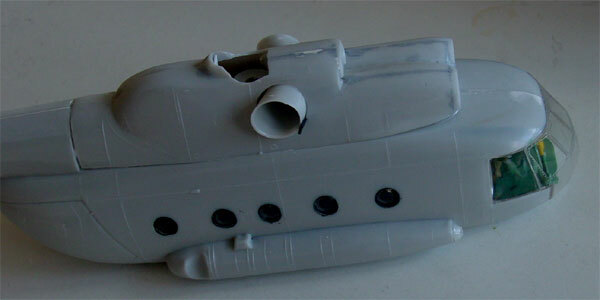 At the exhausts, three little "smoke" pipes were added. The kit gave no assembly problems, you need some minor filler only. 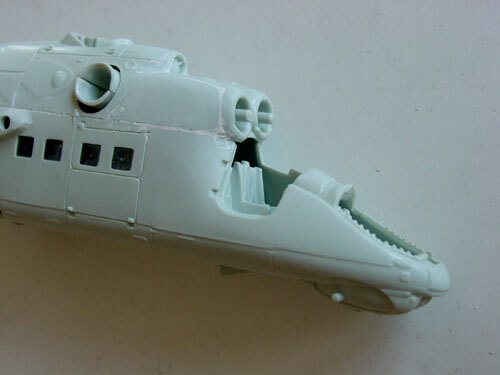 Some panellines were rescribed and some details added were also the very fine rear view mirrors and antennas at the cockpit front area. 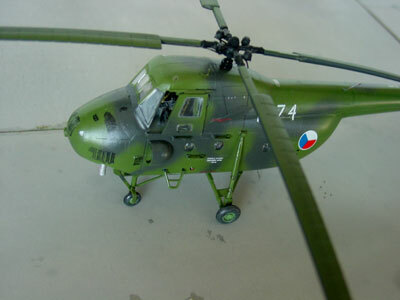 model still without intake covers; nose wheel needs some bending to get the 2 wheels "toucing the ground"
The camouflage applied were Humbrol enamels paints Hu65 light blue, Hu117 green and Hu159 dark brown for a typical Czech AF Hip. Decals came from an assortment with a set of Propagteam Czech roundels and a few helo numbers. Rotor blades were bended down to get a correct look. Also, later on intake covers were added. Note the mirrors! A nice addition to the Czech collection! 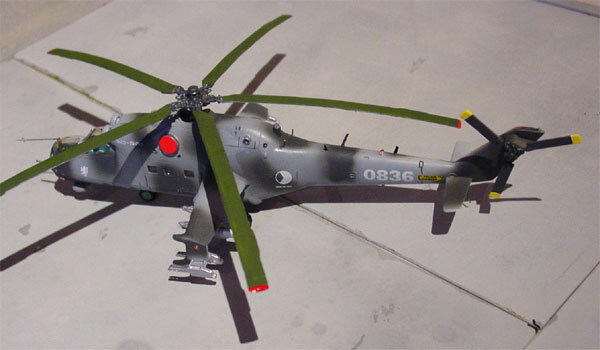 This attack helicopter is widely used in many variants and contrary to the American Apache, it is a multi purpose helicopter as it can also carry some troops in the aft cabin. The kit used is a simple snap together kit sold by Revell under their purchased Matchbox label as kit # 0389 in 1997. Did it originate from Monogram? The kit has no undercarriage as it is to be put on a stand. 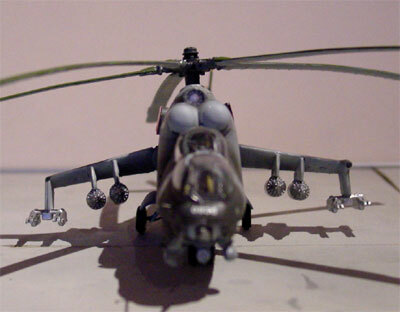 Some parts are rather basic, for example the rotor head and the some parts are simplified. The kit decals are nice. 1. fuselage correction made with a tilted angle; the "Hind" has a tilted rear fuselage as the rotor is tilted as compared to the cockpit section. This is not moulded in this kit. A horizontal saw cut was made in the right fuselage, 1,5 mm strip plastic removed, top fuselage twisted and glued, filled and sanded. This gives a better look. 2. gear bays were cut out and a simple gear added from rod and spare tyres from the spares box. 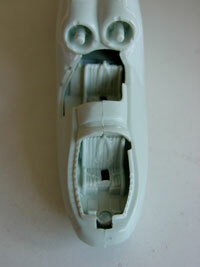 4. cockpit detailed with instruments, rod, sprue and some straps on the seats. 5. store pylons have holes and these were drilled out. 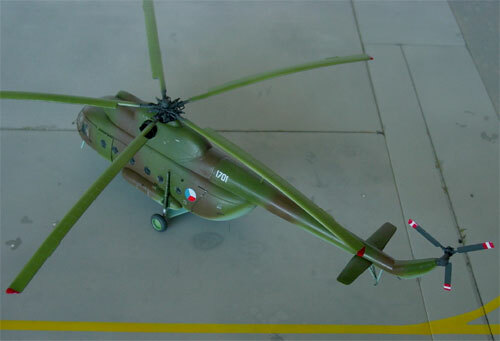 Markings from Propagteam set # were used for a Mi-24 Hind from Czech AF number 0836 with a newer " NATO type" camouflage scheme. The colours are Federal standard approximately FS 36231 grey, FS 36473 light grey and FS 35488 grey. I only used two Humbrol enamels with greys Hu127 and Hu32 dark grey. Note the "tilted" look of the aft fuselage. Finally, some red intake covers were added from cut out thin card. 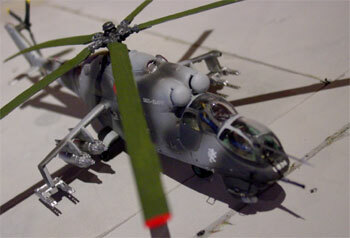 An infra red suppressor was added aft of the main rotor made from a piece of thick sprue. 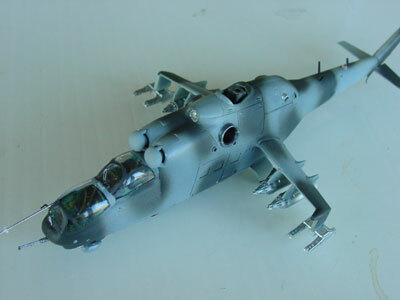 The Hind model is not too bad considering the simple kit started from.